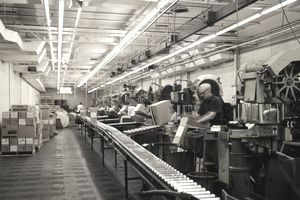 In the discrete production process, an item is produced when a shop order is created for a customer requirement or for a requirement for items to be manufactured to replenish inventory. The shop or production order will show all the tasks, materials, and equipment that will be used in the manufacture of the part. If a material is made from many parts, a bill of materials would have been used to ascertain what items will be needed for the manufacturing process. The shop order will also show the steps that need to be achieved in order to manufacture a finished item. The routing shows the flow of required work that needs to be achieved, which can be one or more facilities and could include work being sent to an external vendor for specialized tasks. The routing determines what work is to be performed and where and how it will be done. The routing decides the path and sequence of operations to be performed on the job from one machine to another. The purpose of routing is to establish the optimum sequence of operations so that the manufacture of the finished item is performed at the lowest cost and the fastest time. Optimized supply chain requires a precise and constantly refined production routing. Operations - On the routing, there needs to be a list of operations that must be performed at a particular time. This requires some kind of resource to be used to perform an operation. The resource could be a piece of equipment such as a drill or a lathe, or it could be a manual resource that would perform a task such as checking quality or performing a measurement. The operation would be allocated a certain amount of time for the task to be performed before the operation is finished and the item is passed on to the next operation. The routing has to have these operations in the correct order for the manufacturing process to be completed correctly. Work Center - The work center is another term for the piece of equipment that is to be used in the operation or the manual resource that is being used to perform a specific task. If the work center is a machine or a piece of equipment, the system will need to know information about that work center such as the capacity of the item. The information about setup and breakdown times need to be established for each work center, so the correct time is allocated to the overall estimated duration for the shop order. Scrap - As part of an operation, the process may produce a certain amount of scrap material. For example, if an operation changes the shape of a component, either by a lathe or saw, there may be a quantity of scrap material that is generated. If the same quantity of scrap is always produced at a certain operation then this can be identified in the routing. Outside Processing - In the manufacture of some items, there may be a need to either send the semi-finished item out for a process to be carried out or for an outside vendor to come into a company's facility to perform the work. This specialized work could be as simple as certifying that an item passes certain quality tests or if an item requires a special coating for a certain customer. Is Lean Manufacturing Relevant Decades After Its Emergence?